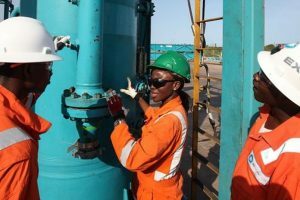 After a decade of commercial oil production, Ghana’s upstream oil and gas sector is still dominated by foreign entities in the provision of goods and services. This situation, according to players in the local value chain, stems from information asymmetry which limits the competitiveness of indigenous Ghanaian companies as well as accusations of lack of transparency in the award of contracts by the International Oil Companies (IOCs) and Service Companies. This, the PC maintains, could be achieved by enhancing capacity of Ghanaian companies through transparent participation in tenders and execution of contracts. Addressing the first ever Procurement Conference in Accra, Chief Executive Officer of the PC, Egbert Faibille Jnr, who described the oil and gas industry as a “catalyst” for economic development advocated measures to optimise the use of local goods, services and the establishment of partnerships and creation of employment. Government, last year, launched an accelerated oil and gas capacity development programme meant to address the challenge characterising the existing capacity building approach for the oil and gas industry. It was to build the capacities of individuals in four thematic areas including Capacity Building for Small & Medium Enterprise which is meant to develop vibrant indigenous SMEs by offering advisory services, financial facilitation and industry specific training. The programme complements the objectives set out in the Petroleum (Local Content & Local Participation) Regulations, 2013 (L.I. 2204). The CEO assured of their commitment to the needs of local content and local participation by the establishment and publication of the petroleum register meant to provide up to date information on all petroleum agreements, details of the Licensees, shareholders, petroleum activities and other information considered relevant to the public and in particular, the business community. A Local Content Fund is also dedicated to supporting local companies who require concessionary finance to undertake oil and gas activities. Another initiative is the unbundling of services to enhance participation of Ghanaian companies in contracts and the reservation of provision of certain goods and services to indigenous Ghanaian companies only. The PC said it will also ensure the full implementation of the requirements of L.I. 2204 (in particular, Regulations 3, 13 and 15). The conference is to enable the Commission and its partners share information relating to current and on-going oil and gas projects; upcoming upstream petroleum projects; procurement and contract opportunities; IOCs and ISPs tender requirements and ultimately to minimise information asymmetry which adversely affects competitiveness of indigenous Ghanaian companies.